No matter what you have in mind, when you’re searching for an individual round ring or a pack, then look no further than our great range at Rope Services Direct. 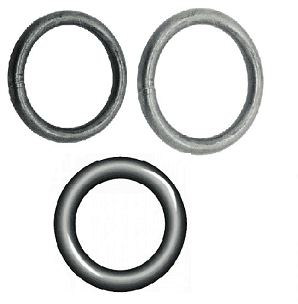 Metal round rings are incredibly versatile and have a huge range of uses from commercial to domestic. Very small ones tend to be found on wallets, bags, horse tack, belts and leisure equipment, whilst the large and very heavy duty ones are used for many marine applications such as in making anchor chains. Made of high grade steel, round rings are essentially a closed loop of metal which is then welded so it stays together in a circle. This offers excellent strength and longevity plus it won’t rust over time, including in humid conditions or sea water. Not quite sure if it’s a round ring you should buy? Don’t worry, it’s not always easy to know! So why not browse our range of snap hooks and lifting shackles too? Plus we have a great range of cargo and ratchet straps to use with your round ring too. Give us your round ring order now! From our extensive warehouse in the Black Country, we’re pleased to offer a large selection of colours and sizes of round rings, including ones with extra large diameters. To instruct us in what you need, simply fill out the e-form here. If you need further advice or to ask a question, please do call our team on 01384 78004. Round Ring Overall rating: 5 out of 5 based on 6 reviews.